WILLIAMSTOWN – For senior Wade Inge, the feeling of accomplishment surging through his veins on a damp Friday night had been a long time in the making. Williamstown (9-0 overall, 5-0 division) used that drive and concept to beat St. Augustine (6-3, 4-1) 14-7 in a game the Braves had the better of play. The simple fact is in the biggest moments, the Braves were better and with the win secured the West Jersey Football League American Division title. “We’ve gone through a lot of adversity,” Williamstown head coach Frank Fucetola said. “The last few years have not been easy but we showed tonight we are the real deal. (St. Augustine) is a real good football team. A really good football team. St. Augustine opened the game strong and took a 7-0 lead on the back of junior Isaiah Raikes. 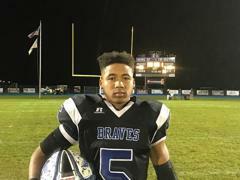 But the ground game disappeared for the most part after that drive as Williamstown made adjustments and the Braves responded with a drive that culminated in a 20-yard run by Inge. “We played as a team,” Inge said. “You look at this whole game everybody contributed. There were no stars, we were all stars. The Braves intentions were set in stone on their final points of the night right before halftime. With just under a minute to play, J.C. Collins dropped back and rolled to his left and went down the left side, a 32 yard pass intended for Damonte Collins. The pass was long and in the hands of a defender, but Collins cut in and wrestled the ball away for the lead. “That’s our determination,” Inge said. With the lead, the Williamstown defense settled in and came up with a pair of big plays to secure the win. The first came on a fourth-and-1 in which the Braves stopped a plunge up the middle. The call itself proved to be interesting. Raikes entered the game and the 6-foot-1, 275 pound defensive tackle appeared to be the obvious choice to run the ball. Instead, he was a blocker. The second, in the waning seconds came in the form of an interception by sophomore Brody Colbert.